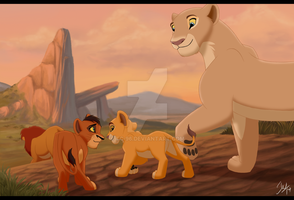 TLK Simba and SP Simba, meet TLG Simba. This is just a joke, no hate intended. Simba's appearance in "The Lion Guard" doesn't really bother me that much, and I'm very glad that the show even exists. But there are some scenes where Simba just looks so funny that I can't help laughing. Dear God! Not only they fucked up Simba's character, his voice actor isn't any better, they could have brought back Matthew Broderick, but nope! They chose Rob Lowe, well I just hope that Donald Glover would make up for it. I could actually forgive them for not bringing back Matthew Broderick since he's a big name movie and stage star. MY question is, why didn't they get Cam Clarke, the actor who voiced Simba on Timon & Pumbaa AND House of Mouse, to voice Simba again? Heck, Clarke even has a role IN The Lion Guard; he voices Mwoga the vulture. Yeah, Cam Clarke would have been better as Simba if they decided to bring him in, if they can't bring back Matthew Broderick, I'm not too fond of Rob Lowe voicing Simba in the Lion Guard, on top of that, Eden Rigel doesn't fit to play Kiara at all, and I doubt that they're ever going to get Neve Campbell back to play Kiara again, I know that they brought back Jason Marsden to play Kovu again, and I'm glad they did, that means they brought back 2 Iconic Roles, James Earl Jones to play Mufasa, and Jason Marsden to play Kovu. I'm going to see how Donald Glover would play out Simba's Role, and see what happens. I'm sure Donald Glover will do OK as Simba. What throws me off when I look at TLG Simba is the visible upper canines. It's so odd. Love the pic though! I agree. They look ridiculous. 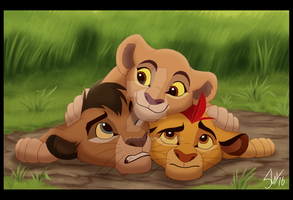 The lion guard screwed up Simba so bad! I can imagine TLG Simba saying this in a hillbilly voice. The teeth are the worst part! 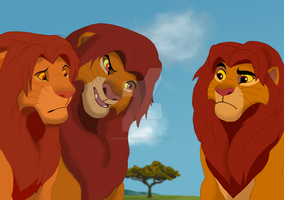 Ya, I think Simba looks better out of TLG tbh XD!!! I'm a little late but, I love this. Even though I'm not a HUGE fan of how much they changed him, the way I think about it is he got older and more mature in SP so his looks changed, pelt and mane got darker, pupil a bit smaller, nose a bit bigger, etc. Also, he got thicker because he's stronger since he was living on little grubs most of his life and then he started eating actual . . . well, lion food. With Nala it's kind of the same, just instead of getting lighter her pelt got darker, her eyes got bluer, and she got bigger, etc. because I mean most of HER life she was hardly eating at all because of all the hyenas. And I know that Kiara's ceremony is different than Fluffy's, but I sort of just took that part out of my headcannon because it messes my brain up. 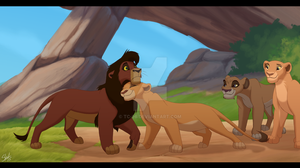 I like Simba as my favorite lion, along with Kovu and Kion. I like TLK Simba better. I do not consider TLG as a bad show,but somehow I just do not see Simbas appearance very mature and I feel as if the character itself is a bit insecure and less prone to the original characteristics of his personality. But in TLK 2 his fur looks more like Sarabis fur, and it's ok because hi is her son xd. Simba's design in the TLG doesn't bother as much as his personality in it. He is such a child in the Lion Guard! Especially in Bunga and the King. 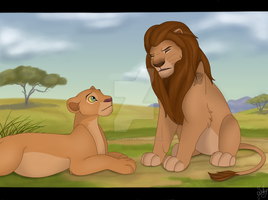 When Bunga and Simba argued, it was like both of them were kids. In SP, I liked his personality a lot better as king. Not flawless but had qualities great for a King and father instead of acting like a cub when you're supposed to be the King. I've noticed that Simba's Pride Simba is noticeably larger and slightly bulkier than his counterpart, presumably because he's actually eating meat and is a good deal older, not just bugs anymore and has smaller pupils, presumably from constantly worrying, possibly not sleeping well from the nightmares of his Dad's death and Scar. I like this theory. I have never thought of it like that before. Makes sense, the guy probably has a LOT of residual trauma from seeing his Father not only die in front of his eyes and being powerless to stop it, but seeing his Father's corpse. 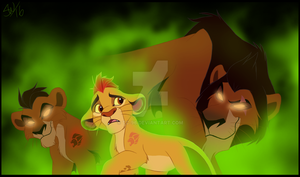 I have no doubt that Scar and Mufasa's death are a sore spot, which is why he reacted so poorly to the Outlanders, coming off as almost uncharacteristically brash. You really know how to put things together, don't you? 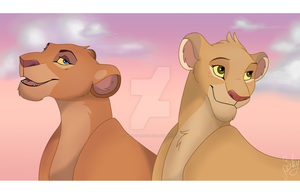 I bet most TLK fans haven't thought about the SP Simba design outside of the fact that it's different from the first Lion King Simba. Really? It seems fairly obvious to me, I mean, you grow old and change your diet and obviously, you're oging to look different. But people don't think about that. At least not a lot. If it weren't for the giant teeth, he wouldn't be so bad. But when I saw this I literally laughed for like ten minutes!! !